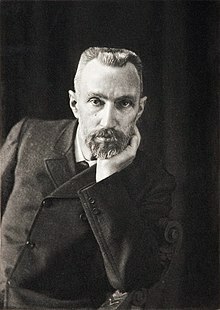 Pierre Curie (15 Mey 1859 – 19 Aprile 1906) wis a French pheesicist, a pioneer in crystallography, magnetism, piezoelectricity an radioactivity. In 1903 he received the Nobel Prize in Pheesics wi his wife, Marie Skłodowska Curie, an Henri Becquerel, "in recognition o the extraordinary services thay hae rendered bi thair jynt researches on the radiation phenomena discovered bi Professor Henri Becquerel". This page wis last eeditit on 18 Apryle 2017, at 03:46.